Located next to the Montparnasse train station, 'Le Nouvel Hotel du Theatre' offers rooms with private bathrooms with free wired or Wi-Fi internet access. It is situated near the Galeries Lafayette Montparnasse and the Montparnasse Tower, while the 'Jardin du Luxembourg' is within half a mile of the hotel. A continental breakfast is served every morning. The 9 soundproofed guest rooms at Le Nouvel Hôtel du Théâtre are equipped with a flat-screen TV, free wired or Wi-Fi internet access, kettle and include a minibar. The private bathrooms feature a shower, sink and hairdryer. For lunch and evening meals, guests are invited to explore the nearby restaurants such as La Coupole or Le Relais de l'Entrecôte, both within 650 metres from the hotel. The hotel is located next to the Montparnasse train station. 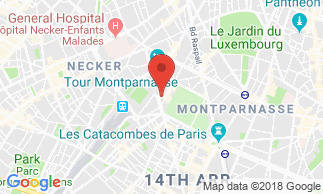 t is situated near the Galeries Lafayette Montparnasse and the Montparnasse Tower, while the 'Jardin du Luxembourg' is within half a mile of the hotel.